This is my third entry in a series I’m calling “Roadtrip Restaurant Reviews.” My first two were in Savannah, GA and New York City, respectively. For my third trip, I went to a city known more for its college football program than a being a foodie destination. However, the combined cities of Auburn and Opelika, AL is slowly growing in restaurant variety and reputation. Auburn and Opelika (pronounced: o-puh-LI-ka), AL are situated right off of Interstate 85 in east Alabama. Even though they’re two separate cities, they sit right next to each other so you can’t tell where one city ends and the other begins. Nearby major metro areas include Atlanta, GA about 2 hours north, Columbus and Fort Benning, GA about 30 minutes east, Montgomery, AL about an hour or so west, and Birmingham, AL about 2 hours northwest. Auburn/Opelika is the quintessential southern Smalltown, USA (combined population about 93,000). Both have charming downtowns areas and are the living embodiment of Southern Hospitality. The area is most well known for being the home of Auburn University, 2-time (or 8-time, depending on who you ask) NCAA D-1 Football champions. Some notable alumni include dual sport superstar, Bo Jackson, Carolina Panthers quarterback Cam Newton, Apple CEO Tim Cook, and best selling mystery author Ace Atkins. I lived in Opelika for the better part of 9 years from 2005 until 2014. I enjoyed my time there, watching the area grow in population, commerce, industry, and diversity. We were in town this weekend to watch the Auburn game against Liberty University and while we were there, we hit up a couple of my old favorite restaurants, and a new favorite that I hope is a sign of things to come in the Auburn/Opelika restaurant scene. On most Saturdays, but particularly on Auburn football home games we attended, my wife and I had a tradition: breakfast at Chappy’s Deli before the game. It was great to revisit this tradition with the kids and grandkids during this weekend’s home game. Chappy’s is a regional favorite with locations in Montgomery, Prattville, and Auburn, AL. Their motto is “New York Flavor, Southern Hospitality.” Chappy’s serves a couple of New York inspired sandwiches which includes Ruebens and Pastramis and Swiss as well as traditional favorites like Clubs and French Dips. Most of my visits to Chappy’s have been for breakfast. They serve a full breakfast menu which includes various omelets, pancakes, waffles, etc. For this visit, I went with my usual: The Conecuh Omelet. Conecuh sausage is locally made in Evergreen, AL and shipped all over the US. Their Hickory Smoked Sausage is my favorite; a perfect blend of spices with just a little front end heat. It doesn’t overwhelm and makes you dig in for more. 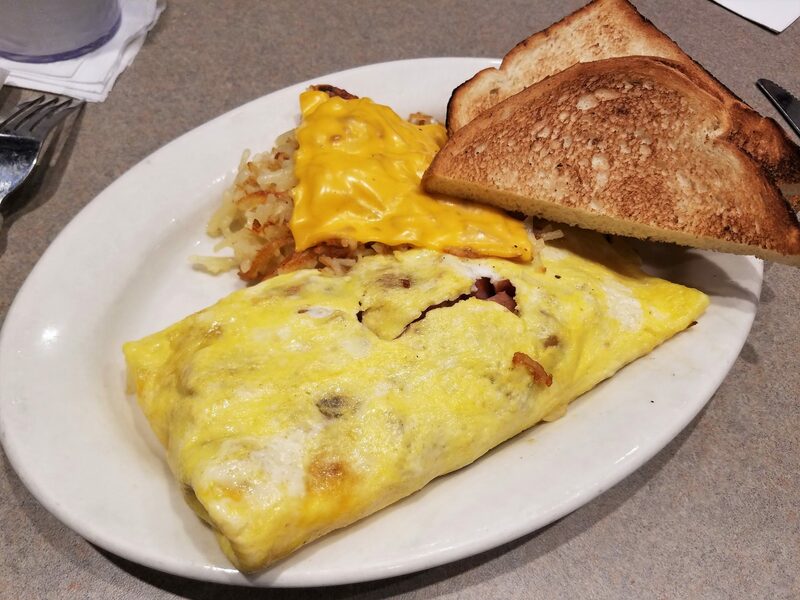 The Conecuh Omelet is a 3-egg omelet stuffed with the aforementioned sausage, shredded cheese, and grilled hashbrowns. The sausage was cooked perfectly with a nice snap to each bite and the heat blending well with the hashbrowns and cheese. It’s a hearty breakfast and sticks with you for a full day of Auburn Football. 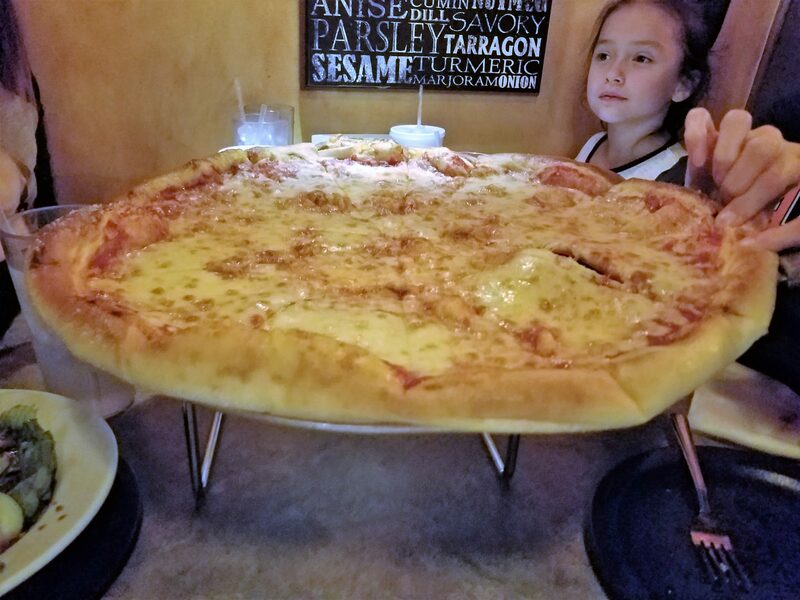 After watching Auburn wallop Liberty University 53 – 0, everyone was in the mood for pizza, so we went to Brick Oven Pizza Company in East Alabama’s largest retail center: Tiger Town Shopping Center. Brick Oven is one of the best pizza places in the Auburn/Opelika area. Most of the pizza places are chains, so having a local option with an actual brick oven is fantastic. We ordered a Garlic Parmesan bread starter called “Dadgum Bread.” It’s a thick round loaf of bread. It’s dense, chewy, and tasty. 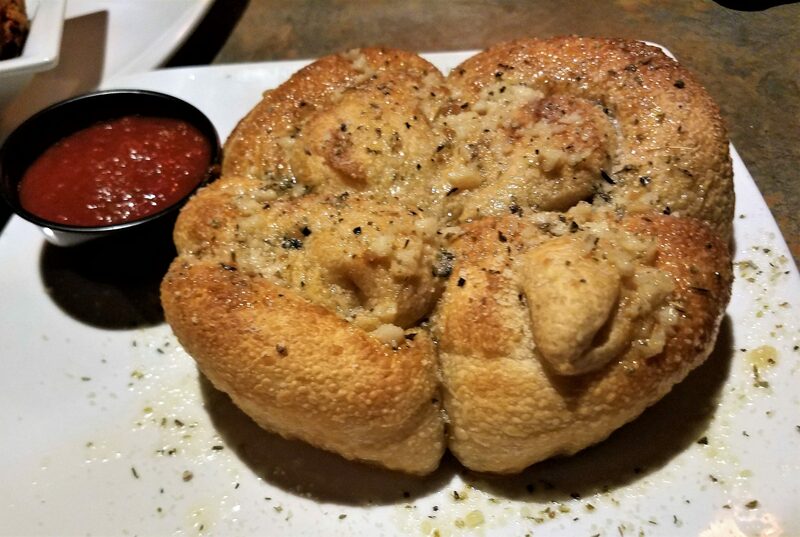 It’s an interesting twist on the traditional garlic bread starter. For the pizza, we ordered a simple cheese pizza and the Brick Oven Classic; a cheese pizza topped with pepperoni, sausage, bacon, mushrooms, green peppers, onions, tomatoes, and black olives. The brick oven gave the crust a nice char with the slightly burnt bottoms giving a light bitter taste to offset the richness of the cheese and toppings. The dough used to make the Dadgum Bread is also used to make the pizza crust, so it had that same satisfying chewy texture. The cheese pizza was great, but the Brick Oven Classic is a supremely Supreme pizza. I saved this restaurant for last even though it was one of the first places we went to. 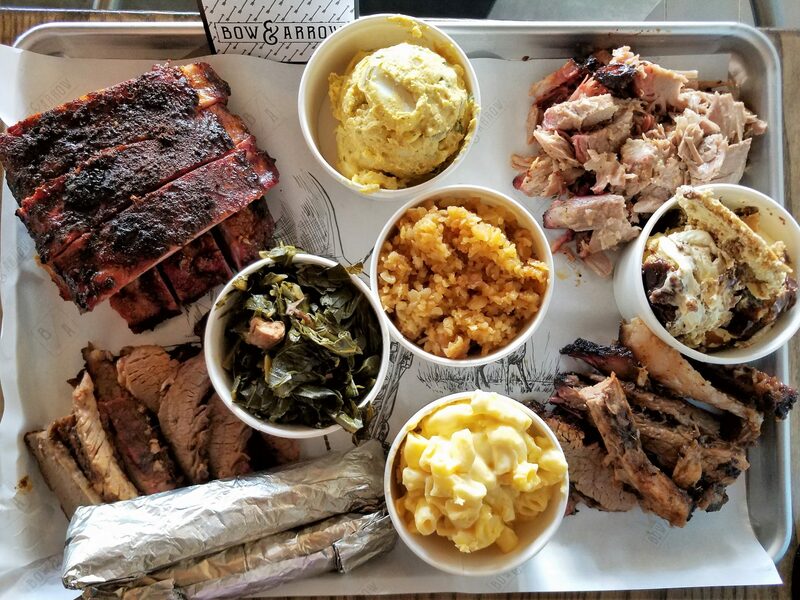 Bow and Arrow BBQ just opened on November 5, 2018 and serves Texas style BBQ. It’s also the latest venture by celebrated local chef, David Bancroft and his up-and-coming executive chef, Caleb Fischer. Chef Bancroft’s first Auburn restaurant, Acre, opened in 2013 and redefined fine dining in east Alabama, sourcing many ingredients from an on-site garden as well as local orchards and farms. Bancroft was born in San Antonio, TX, but spent many years in Alabama and graduated from Auburn University. He’s also a 3-year semifinalist (2016, 2017, and 2018) for the James Beard Award for “Best Chef: South.” He appeared on on Food Network’s Iron Chef Showdown in 2017 and defeated Iron Chef Jose Garces. One of the sous chefs on his winning team was Caleb Fischer, who himself appeared on Food Network’s “Spring Baking Championship” in the spring of 2018. Having eaten at Acre when they first opened, I was very excited to try Bow and Arrow. It’s a different concept than Acre. 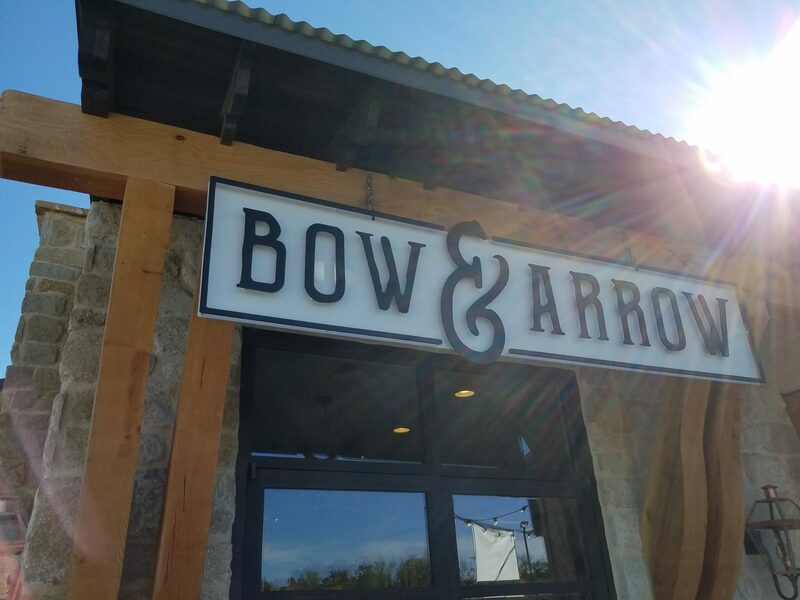 While Acre is more fine dining, Bow and Arrow is a fast-casual concept with approachable prices and family style seating. Walking in, you feel like you stepped into a hunting lodge with the many deer head mounts lining the walls, natural wood accents and tables, exposed beams, and even a hunting themed video game in the corner. It’s a beautiful space. Bancroft describes Bow and Arrow as “South Texas BBQ meets Alabama Pot Luck.” Brisket is heavily featured on the menu, alongside BBQ staples like pulled pork, chicken, sausages, and turkey. As you walk up to the ordering line, you’re met with what I can only describe as a meat merry-go-round. It’s a 3-tier smoker that rotates so the pitmaster can get the meat you want. The smells emanating from that wonderful contraption fill the room and wafts throughout the space. Everyone walking in immediately smells the smoke and meat, conversations stop, heads tilt slightly upward and nostrils flare so the olfactory nerves can take in as much of that scent as possible. It’s a grand first impression. Ordering is done a la cart. I decided to go big. I ordered both lean and moist brisket, pulled pork shoulder, St. Louis ribs, four sides, a dessert, and a partridge in a pear tree. I wanted to order the smoked half chicken, but that’s only served on Saturdays and Sundays. They also ran out of sausage and had a delivery mishap with the turkey; otherwise I would’ve ordered all of that as well. For the sides, we ordered potato salad, mac & cheese, Potlikker Greens, and the Tater Tot Casserole. For dessert, we ordered some of Memaw’s Éclair. Our order came with housemade tortillas and a variety of BBQ accoutrements like housemade bread and butter pickles, hull pea chow chow, marinated onions, various salsas etc. A nice selection of acidic, briny bites to help refresh the palate after a few mouthfuls of rich BBQ meat. For the sauces, they offer a Carolina style mustard sauce, a Texas style red sauce, and an Alabama style white BBQ sauce, again, all housemade. Nothing in Bow and Arrow is premade or comes in some sort of mix. Everything is made from scratch, in house. The brisket is fantastic. Even the lean brisket was still moist. The moist (fatty) brisket was my favorite of the pair, with good sized hunks of fat running through the brisket to keep it moist. It melted in my mouth and tasted fantastic. I’m usually a “take-it-leave-it” guy with brisket, no strong opinions either way, but that fatty brisket was brilliant. The pulled pork was also tasty, but paired with the Texas Red Sauce and wrapped in one of the freshly made tortillas was truly a thing of beauty. The tortillas were warm and tender, but more importantly, structurally sound, able to handle the pile of meat placed upon it for maximum pork delivery into my face. The pork itself was tender and beautifully smoked. But the real highlight of my butcher paper lined metal tray was the St. Louis style pork ribs. They had a beautiful bark to them and, like the brisket, a beautiful pink smoke ring all the way around. The meat had some chew, but was still tender and pulled delightfully from the bone. I bit into the ribs and juice ran down my chin; a sign of a great rib, in my opinion. Six ribs came with a half rack order and before I realized it, there were four clean rib bones on my tray before my wife even had a chance to try one. These ribs were smoky, a little sweet, a bit of heat, and a ton of flavor. Truly some of the best ribs I’ve had the pleasure of eating. It completely rewired my brain on how I think ribs should be. For the sides, the highlights were the mac & cheese and potato salad. The mac & cheese really did remind me of some of the macs & cheese that made their way to many a church pot luck gatherings. The cheese was smooth and creamy and the noodles were cooked perfectly. The potato salad was a southern style, mustard based potato salad. It had nice large chunks of al dente potatoes and a light vinegary flavor from the mustard base. The Potlikker Greens were fine, but I’m not a huge fan of greens in general. My wife liked them, but thought some of the pieces had too much stalk attached and made them overly chewy. The only real side item disappointment was the tater tot casserole. I was looking forward to this one as I love tater tots; however, I found the casserole a bit dry and wishing for some melted cheese or some kind of creamy sauce to go on top. Not a deal breaker, but was expecting more. The house made bread and butter pickles were the star of the complimentary condiment bar. They were perfectly crunchy and had the right amount of acidity to battle mouth fatigue from all the smoky goodness. Eat a few ribs, then eat a few bread and butter pickle chips to get a second wind for the rest of the meal. I did save a bit of room for dessert and it did not disappoint. Memaw’s Éclair is really a pie version of the popular handheld dessert. On the bottom is a graham cracker crust, then a layer of chocolate ganache, then topped with éclair cream and more graham crackers. The graham crackers soaked up the chocolate ganache and offered a bit of texture to a very smooth dessert. It was a great ending to our meal. Overall, I’m encouraged with the caliber of restaurants that are starting to pop up in the Auburn/Opelika area. 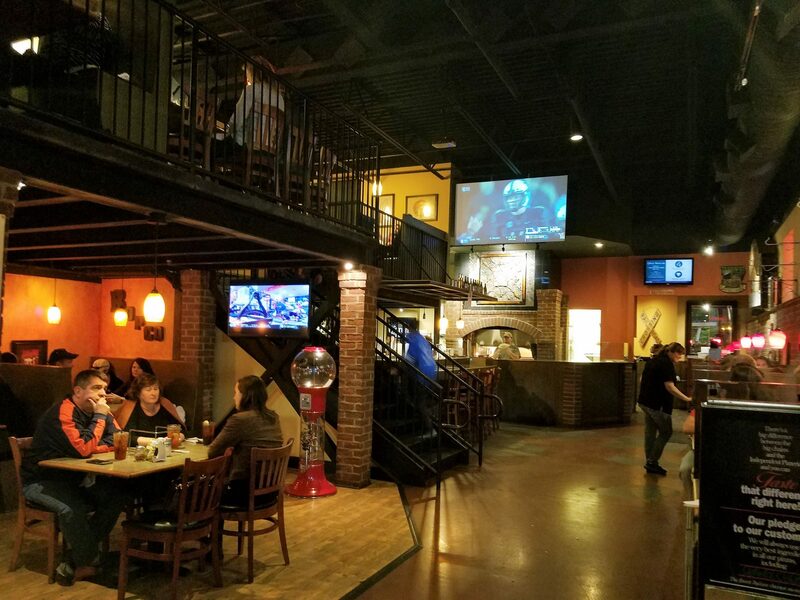 For many years, chains ruled the dining options, but more and more locally owned restaurants are starting to make their mark. Not just the places I reviewed above, but also great places I’ve visited during my years there like Ma Fia’s Ristorante in the revitalized historic downtown Opelika area, serving some top notch Italian fare. There’s also Irish Bred Pub in the same downtown Opelika area that’s doing some amazing things with the simple Beef Stew. And Warehouse Bistro, a popular Opelika fine dining restaurant that suffered a major fire in 2017 but has bounced back and reopened in November 2018 under new executive chef and owner Paul Diaz. Or MK’s Asian Kitchen, a place I frequented so much while living in Opelika that even after four years of not going there since we moved to Jacksonville, the owner still remembered my name and knew my usual order when we went there during this weekend. Or Amsterdam Café in Auburn where Chef Bancroft was executive chef for years before venturing out on his own with Acre. And I love a good food truck success story, so I have to mention Butcher Paper BBQ in Opelika, owned and operated by Mark Coxwell. What started as a humble food truck is now a thriving brick-and-mortar restaurant and catering business slinging some great barbeque all over the city.